Home › Resources › Knowledge › Financial Modeling › What is Sensitivity Analysis? Sensitivity Analysis is a tool used in financial modelingWhat is Financial ModelingFinancial modeling is performed in Excel to forecast a company's financial performance. Overview of what is financial modeling, how & why to build a model. A 3 statement model links income statement, balance sheet, and cash flow statement. More advanced types of financial models are built for valuation, plannnig, and to analyze how the different values of a set of independent variables affect a specific dependent variable under certain specific conditions. In general, Sensitivity Analysis is used in a wide range of fields, ranging from biology and geography to economics and engineering. It is especially useful in the study and analysis of a “Black Box Processes” where the output is an opaque function of several inputs. An opaque function or process is one which for some reason can’t be studied and analyzed. For example, climate models in geography are usually very complex. As a result, the exact relationship between the inputs and outputs are not well understood. A Financial Sensitivity Analysis, also known as a What-If analysis or a What-If simulation exercise, is most commonly used by financial analystsThe Analyst Trifecta® GuideThe ultimate guide on how to be a world-class financial analyst. Do you want to be a world-class financial analyst? Are you looking to follow industry-leading best practices and stand out from the crowd? Our process, called The Analyst Trifecta® consists of analytics, presentation & soft skills to predict the outcome of a specific action when performed under certain conditions. Financial Sensitivity Analysis is done within defined boundaries that are determined by the set of independent (input) variables. For example, Sensitivity Analysis can be used to study the effect of a change in interest rates on bond prices if the interest rates increased by 1%. The “What-If” question would be: “What would happen to the price of a bond If interest rates went up by 1%?”. This question is answered with sensitivity analysis. 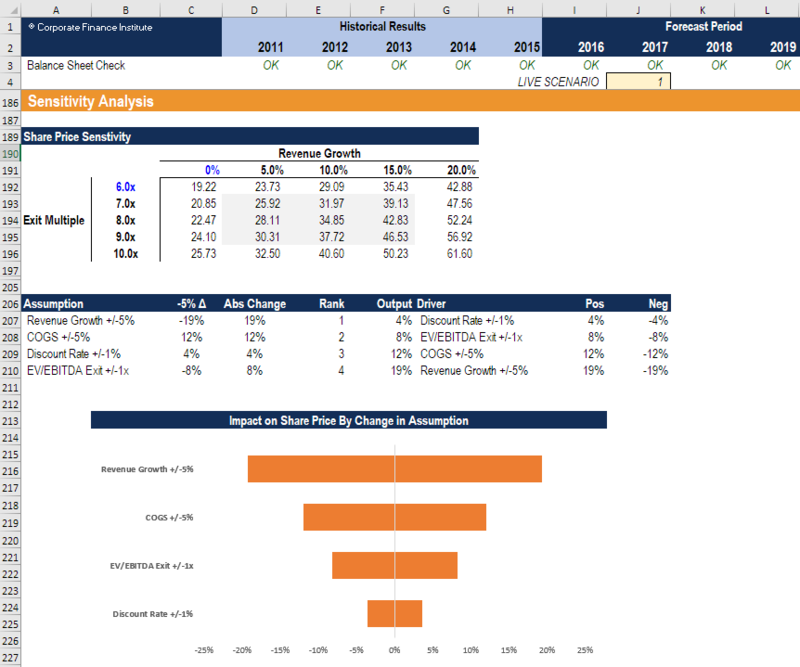 The analysis is performed in Excel under the Data section of the ribbon and the “What-if Analysis” button, which contains Goal Seek and Data Table. These are both taught step by step in our free Excel Crash Course. John is in charge of sales for HOLIDAY CO that sells Christmas decorations at a shopping mall. John knows that the holiday season is approaching and that the mall will be crowded. He wants to find out whether an increase in customer traffic at the mall will raise the total sales revenueSales RevenueSales revenue is the starting point of the income statement. Sales or revenue is the money earned from the company providing its goods or services, income of HOLIDAY CO and if so, by how much. The average price of a packet of Christmas decorations is $20 and during the previous year’s holiday season, HOLIDAY CO sold 500 packs of Christmas decorations, resulting in total sales worth $10,000. After carrying out a Financial Sensitivity Analysis, John determines that a 10% increase in customer traffic at the mall results in a 7% increase in the number of sales. Using this information, John can predict how much money company XYZ will generate if customer traffic increases by 20%, 40%, or 100%. Based on John’s Financial Sensitivity Analysis, these will result in an increase in revenue by 14%, 28%, and 70%, respectively. Learn how to build a table like this in our Free Excel Crash Course! It is important not to confuse Financial Sensitivity Analysis with Financial Scenario Analysis. Although similar to some degree, the two have some key differences. Sensitivity Analysis is used to understand the effect of a set of independent variables on some dependent variable under certain specific conditions. For example, a financial analyst wants to find out the effect of a company’s net working capital on its profit margin. The analysis will involve all the variables that have an impact on the company’s profit margin such as the cost of goods soldAccountingOur Accounting guides and resources are designed as self-study guides to learn accounting and finance at your own pace. Browse hundreds of articles on important topics such as the income statement, balance sheet, cash flow statement, depreciation methods, how to link the 3 statements, debits & credits, journal entries, workers’ wages and managers’ wages, etc. The analysis will isolate each of these fixed and variable costsFixed and Variable CostsFixed and variable costs are important in management accounting and financial analysis. Fixed costs do not change with increases/decreases in units of production volume, while variable costs are solely dependent on the volume of units of production. This guide teaches an analyst the fixed vs variable cost methods and record all the possible outcomes. Scenario Analysis, on the other hand, would require the financial analyst to describe a specific scenario in detail. Scenario Analysis is usually done to analyze situations involving major shocks such as a global market shift or a major change in the business. After specifying the details of the scenario, the analyst would then have to specify all the variables, so that they align with the scenario. The result is a very comprehensive picture of the future (a discrete scenario). The analyst would know the full range of outcomes, given all the extremes, and would have an understanding of what the outcomes would be, given a specific set of variables defined by a specific real-life scenario. Sensitivity Analysis adds credibility to any type of financial modelTypes of Financial ModelsThe most common types of financial models include: 3 statement model, DCF model, M&A model, LBO model, budget model. Discover the top 10 types of Excel models in this detailed guide, including images and examples of each. Financial modeling is performed for many reasons including to value a business, raise money by testing the model across a wide set of possibilities. Financial Sensitivity Analysis allows the analyst to be flexible with the boundaries within which to test the sensitivity of the dependent variables to the independent variables. For example, the model to study the effect of a 5-point change in interest rates on bond prices would be different from the financial model that would be used to study the effect of a 20-point change in interest rates on bond prices. Sensitivity analysis helps one make informed choices. Decision-makers use the model to understand how responsive the output is to changes in certain variables. This relationship can help an analyst in deriving tangible conclusions and be instrumental in making optimal decisions. What are sensitivity analysis best practices? Layout, structure, and planning are all important for good sensitivity analysis in Excel. If a model is not well organized both the creator and users of the model will be confused and the analysis will be prone to error. The direct method involves substituting different numbers into an assumption in a model. For example, if the revenue growth assumption in a model is 10% year over year (YoYYoY (Year over Year)YoY stands for Year over Year and is a type of financial analysis that's useful when comparing time series data. Analysts are able to deduce changes in the quantity or quality of certain business aspects with YoY analysis. In finance, investors usually compare the performance of financial instruments on), then the revenue formula is = (last year revenue) x (1 + 10%). In the direct approach, we substitute different numbers to replace the growth rate, like 0%, 5%, 15%, and 20% and see what the resulting revenue dollars are. The indirect method (as shown below) inserts a percent change into formulas in the model, instead of directly changing the value of an assumption. With the same example as above, if the revenue growth assumption in a model is 10% year over year (YoYYoY (Year over Year)YoY stands for Year over Year and is a type of financial analysis that's useful when comparing time series data. Analysts are able to deduce changes in the quantity or quality of certain business aspects with YoY analysis. In finance, investors usually compare the performance of financial instruments on), then the revenue formula is = (last year revenue) x (1 + 10%). Instead of changing 10% to some other number, we can change the formula to be = (last year revenue) x (1 + (10% + X)). Where X is a value contained down in the sensitivity analysis area of the model. learn how to do this step by step launch our sensitivity analysis course now! Sensitivity analysis can be challenging to comprehend even by the most informed and technically savvy finance professionals, so it’s important to be able to express the results in a manner that’s easy to follow. Data tables are a great way of showing the impact on a dependent variable by changing up to two independent variables. 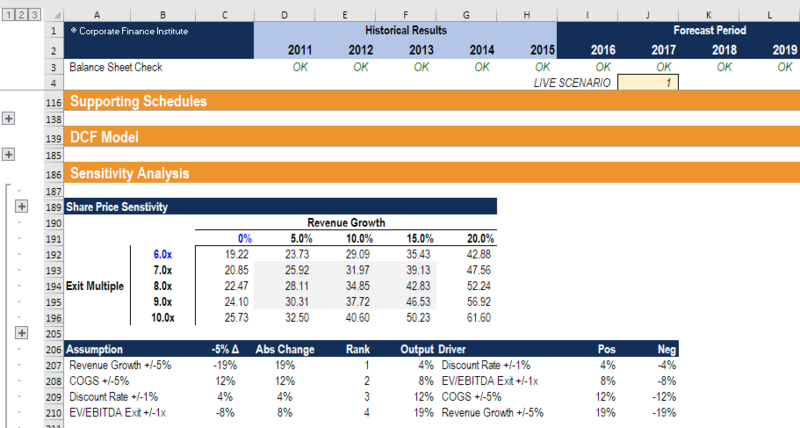 Below is an example of a data table that clearly shows the impact of changes in revenue growth and EV/EBITDA multipleEV/EBITDAEV/EBITDA is used in valuation to compare the value of similar businesses by evaluating their Enterprise Value (EV) to EBITDA multiple relative to an average. In this guide, we will break down the EV/EBTIDA multiple into its various components, and walk you through how to calculate it step by step on a company’s share price. Tornado Charts can be a great way of showing the impact of changes to many variables at once. They are called Tornado Charts because they are sorted from the most impactful to least impactful in a way that shapes the chart like a tornado cone. 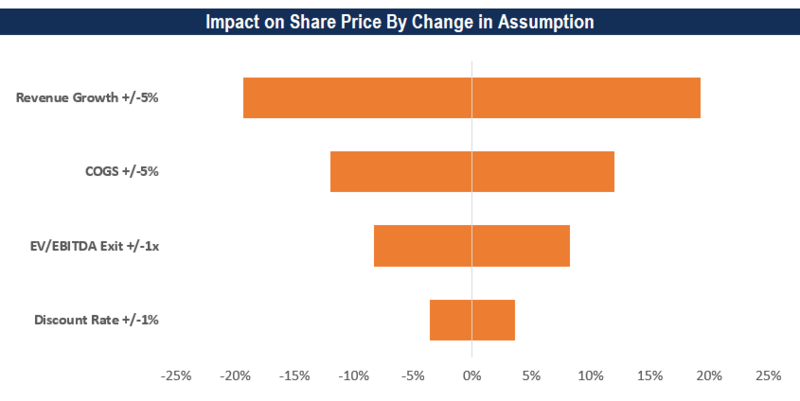 To learn how to build these charts, launch our sensitivity analysis in Excel course now!